A new show by Bernhardt Paul, the famous director of the German Roncallli Circus and of the Apollo Variety. With his oriental style act, Omar Pasha fits perfectly in this show. Louis Ostrowsky (the 4th generation in that magical Black Art tradition) gets ovations at each performance. We are again in that theater nestled directly under the Rheinknie bridge spanning the Rhine. Its position is unusual and appealing. A bar and a restaurant are installed in the spacious ground floor foyer. Through large windows there is a panoramic view over the river and onto the promenade along its banks. Large stairs go down to the showroom where tables and seats are arranged in tiers. From any seat, spectators have a perfect view over the stage. The stage has good width and height. The aerial artists feel fine there, as well as the other circus and music-hall artists. 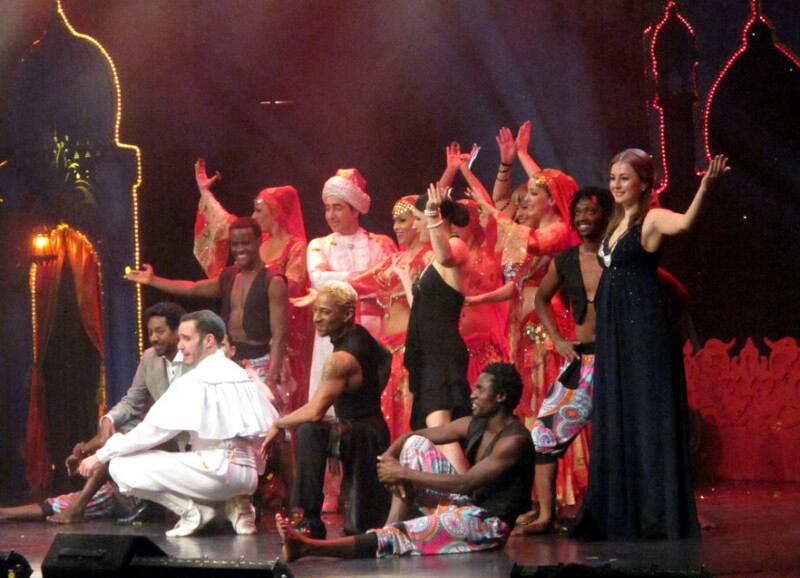 Over a few rehearsal days, the “1001 Nights in Marrakech” show is set up. Tobias Fiedler is the competent, efficient and smiling director. Oguz Engin is the M.C. It is a real pleasure to meet again, quite a few years after having already worked together. He is the oriental storyteller and also demonstrates his great talent as a conjurer. Moreover he introduces the different acts. For the last days of the engagement, as he was already booked for a long season at the Europa Park, Oguz is replaced by the excellent ventriloquist from Berlin, Daniel Reinsberg. All the artists take part in the show’s Opening and Finale, which is usual in Germany. Except for Oguz, we were not yet acquainted with our colleagues, but our relationships are immediately warm and hearty. They are : the New Scala Ballet; the Liazeed Duo, acrobats and Chinese pole; the Nafsi Acrobats from Kenya; Erna Sommer, trapeze; Ornela Bogino, antipodiste; Sofiane Aberkane mime in the Statue act and Svetlana Goncharenko, sand painting. We begin to share an almost common life for three months. We spend a lot of time together backstage, or actually, in the corridor to the stage, connecting the (small) dressing rooms. The corridor’s wall is covered with posters from previous Apollo shows and from the Roncalli Circus. Signed artists’ pictures from previous performances are also exhibited there. We will all have a lot of time to look at these in detail, when warming up, preparing stage costumes or organizing props before performing. In fact, this corridor is a waiting room for artists : sitting or lying on the floor, getting ready or resting. Various languages are spoken : German, English, French, Spanish, Italian. We often laugh. On days with two shows, one, two or even three children come and complement the corridor’s life. 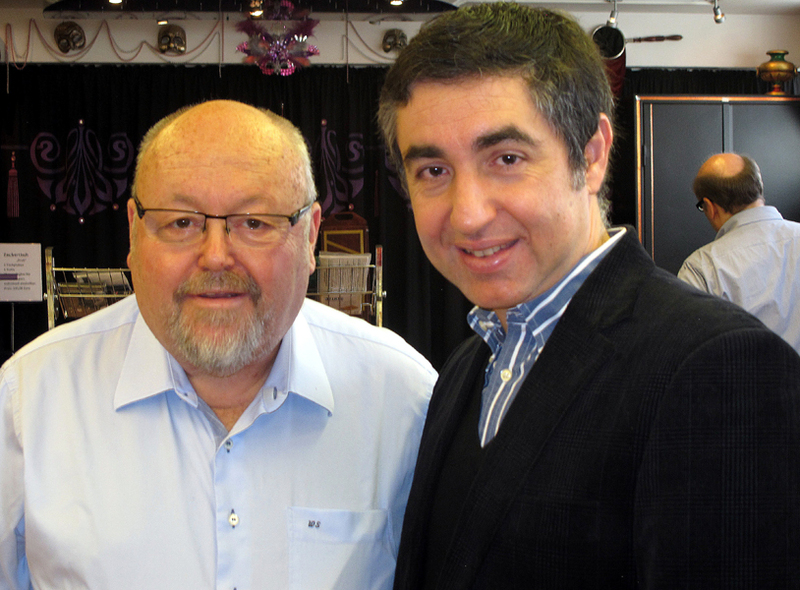 During our stay, we have a wonderful reunion at the Düsseldorf Magic School with its director, Wolfgang Sommer. He has been a former president of the German Magicians and the executive president of the FISM World Congress which was held in 1997 in Dresden, Germany. We performed at this FISM Convention in the international magic show and parts of this were broadcast for the NHK Japanese Television. We spent a wonderful few hours that afternoon, in company with Oguz, reminiscing over a thousand and one memories and looking at dozens of posters and documents relating to magic, from Wolfgang’s extensive collection. See also more pictures about Düsseldorf 2015 in the GALLERY section, click : “Germany, Düsseldorf, 2015” . To finish, Omar Pasha makes people disappear and then, he, himself, is no longer on. Hop! He is away – but he just was there in his white costume. Reality, dream, magic ? He is a master who dominates the Black Art’s theater method. What you see, there on stage, is simply incredible. Reality, illusion, or just a dream ? Objects appear and disappear, flames move from one candle to an other, heads float in the darkness . . . Omar Pasha produces a marvelous magical Black Art, a magic which takes you into the world of the Thousand and One Nights. Along the decades, that magical art, which dates back to 1885, is maintained to perfection. 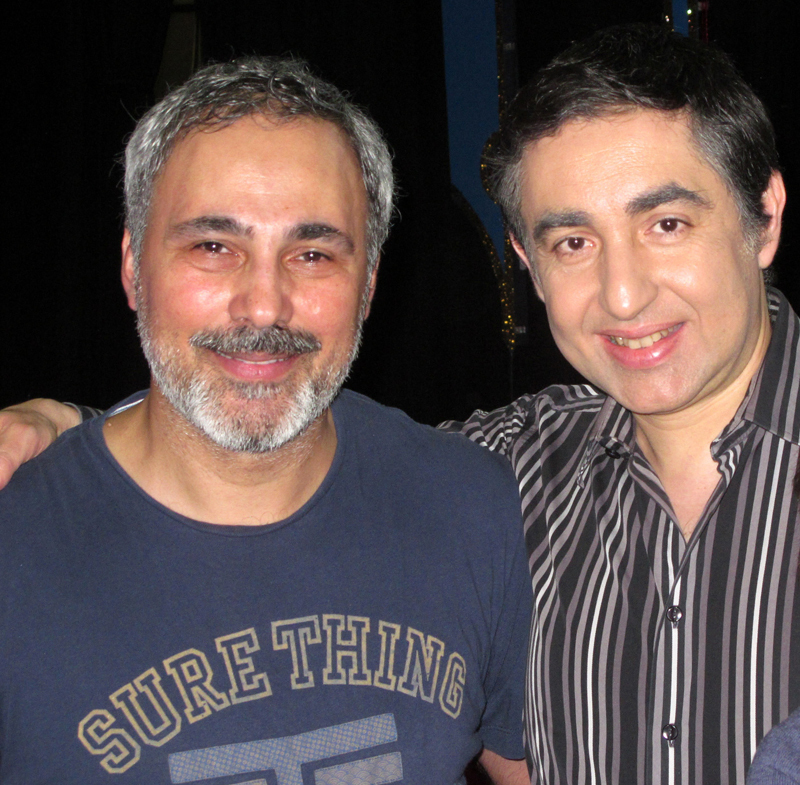 Nowadays Omar Pasha is regarded worldwide as the one and only illusionist who brilliantly masters this magical technique.